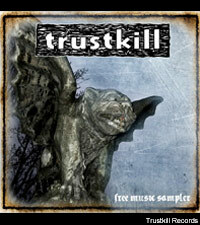 Trustkill's September 2009 sampler isn't just another smattering of the label's offerings. Most Precious Blood guitarist Justin Brannan serves as the sampler host -- almost like a radio DJ. "If someone told me when I was a boy that one day I would be hosting the Trustkill sampler, I would've never believed them," the hyperbolic Brannan told Noisecreep. "It's the most amazing feeling. It's better than falling in love, better than any drug known to man. It's the Alpha and the Omega. It's everything. I think even the birth of my first child one day will pale in comparison to this. It's hard to find something to live for now that I've done it all. There are no dreams ... this is it. I have arrived, and it's all downhill from here, unfortunately. When [Trustkill head honcho] Josh [Grabelle] asked me to do it again it was a blessing and a curse: a blessing because of the joy I knew it would bring but a curse because I knew I'd spend the rest of my life chasing that podcast high. In his bits describing the songs and bands on the sampler, Brannan is clearly enjoying himself -- making fun of his own band, ascribing 'cult status' to the band and reminiscing about the days before Twitter and Facebook, when getting the word out about bands and shows was done via photocopied flyers. Brannan admits to missing those olden days, saying, "It was pure and different. Things were scary and unknown. It was like being a part of a secret society. Speaking in code about things the rest of the world didn't understand. You read the thank you lists inside other bands albums to find out about new bands to check out. Maybe you wore a Black Flag pin on your denim jacket. It was very understated; it wasn't about the style or advertising it to the world. These days, it's all about Twitter and vampires. 'American Idol'-core and Cinnabon at the food court. Maybe a wizard or a warlock here and there. People are suckers for a good warlock comeback story."